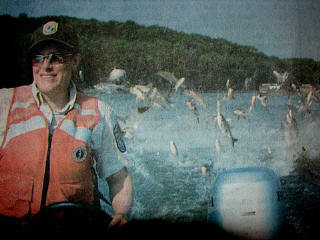 Flying Carp.... More Than Just a FISH STORY! with Live Video Link! by Ruth Nissen, Wisconsin DNR. All photos contain further comments by Pat Middleton. Hold your cursor over the photo to see captions. See our UPDATED Weekly fishing report! Great photos of REALLY BIG recent Mississippi River catches! Imagine if you can, 10-20 lb fish jumping into your boat as you idle in a side channel of the Mississippi River. A classic fish story, but one that has become true in the Missouri and Mississippi Rivers. 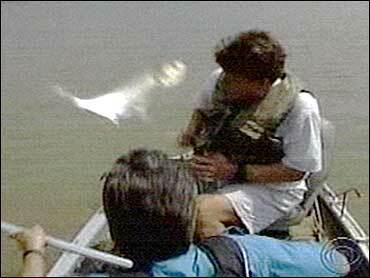 In reality, it is a situation than can be downright hazardous especially when a 20-lb fish comes flying at your head. Biologists from the Long Term Resource Monitoring Program have reported being hit multiple times by large jumping fish on the Mississippi River north of St. Louis while electrofishing to sample fish populations. Unfortunately, the fish in this case is the bighead carp, not exactly the fish of dreams, because they have little or no value as a game fish. In addition to their jumping ability these fish are notable for their appearance and their size. the location of their eyes which are located far forward and low on the head gives a fish a rather bizarre appearance. These fish grow incredibly fast and reach about 25 inches by the second ear, eventually reaching over 28 inches long and 40 to 50 pounds. In Some Bank Waters of the Mississippi River and in some locations in Indiana, (which are now filled with big head, silver and some common carp rather than native fish species(, commercial fishermen have had to abandon their traditional fish and style because the carp are so large and abundant the fishermen can't even lift their nets. The big head were brought to the U. S.in 1973 from China to help improve the water quality and control plankton populations (microscopic animals and plants( in catfish farms, initially in Arkansas. By 1978, space the importation and possession of an of big head carp was prohibited, a but the damage had already been done. Big head carp had already escaped into nearby river works. Farmed fish ponds are not closely controlled or monitored and are often located in bottom lands that are subject to flooding, thereby offering an easy escape route for these exotic carp. become true in the Missouri and Mississippi Rivers. In reality, it is a situation than can be downright hazardous especially when a 20-lb fish comes flying at your head. Biologists from the Long Term Resource Monitoring Program have reported being hit multiple times by large jumping fish on the Mississippi River north of St. Louis while electro-fishing to sample fish populations. 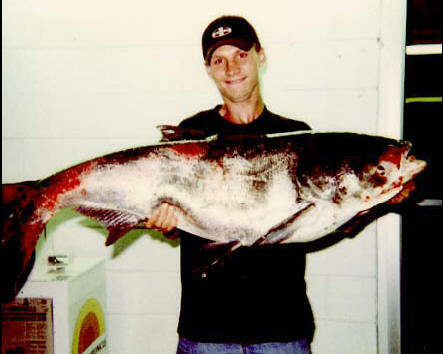 Unfortunately, the fish in this case is the bighead carp, not exactly the fish of dreams, because they have little or no value as a game fish. !! Click photo on right to watch a U TUBE VIDEO of Flying Carp on the Illinois River! Big head carp filtered feed on zooplankton which puts them in direct competition for food with paddlefish, bigmouth Buffalo, and gizzard shad as well as all the young native fish. The carp have the edge on our native species because of their large section volume, and voracious appetites, which enables them to quickly decimate concentrations of zooplankton. To make matters worse, the carp are also prolific breeders and they got so large so fast that not much else is big enough to eat them. Eventually the big head carp found its way into the Mississippi and Missouri River systems and is currently reported in 22 states including Iowa, Illinois, and South Dakota. They are furthest northern points so far on the Mississippi is the dam at Cape Cod, Iowa. However, officials report big head carp stacking up like cord wood below dams on the Missouri, Des Moines and the upper Mississippi River's trying to penetrate upstream River reaches. This species alter the potential range in North America is unknown. Common carp -- this well-known carp was introduced by German immigrants in the 800s for food. In 1877, the United States fisheries commission received 345 carp from Germany, which were propagated and distributed to 38 states and territories. Car park known for being prolific, quickly dominated in a fishery, union almost anything, and for stirring up the bottom sediments, which harms the water quality and destroys the habitat for fish and other aquatic creatures. Grass carp -- a carpet imported in 1963 from eastern Asia to control aquatic plants and fish farms. 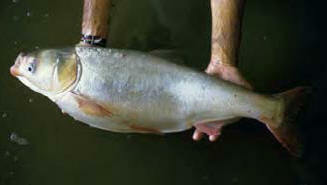 Grass carp have been also used to control dams stands of aquatic plants in impoundments, but in some cases grass carp have literally cleared a lake of aquatic plants. Plants that provide important habitat for fish and other aquatic creatures. despite restrictions on the introduction of grass carp they are now found in 45 states, including the Mississippi River as far north as Wabasha, Minnesota. Silver Carp -- this species, also imported from Asia, is similar to the big head in feeding habits although it may be even more efficient at filtering small food items from the water column. It also grows to a large size and like the big head carp can only be caught in Matt's or by snagging. The European or common carp is so widespread today that it is considered by most to be part of our native fish farmer likewise the Asian carp will likely be thought of buying our grandchildren as native however, the Asian carp are potentially far worse because they compete more directly with their native fish and shellfish for food and habitat. The extent to which they can replace the native fish was well illustrated by several fish kills in a book backwater slew of the Mississippi River south of St. Louis that occurred October 2000. 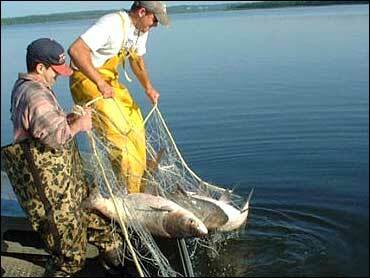 More than 97% of the carcasses found were Asian carp. Now it appears the stage has been set for the invasion of yet another Asian carp, the black carp. Adult black carp, which reached a three to 4 feet in length, feed primarily on mollusks parentheses snails, clams and mussels( crash to the shells with their powerful teeth. Similar to the other carp now living in our waters, these carp also possess a voracious appetites and a rapid rate of reproduction. Because of these attributes, black carp are referred to as river rabbits in Australia. This species is currently being proposed for widespread use in fish farms to control snails, the intermediate host of a grub like parasite affecting catfish. it has been reported at least seven catfish farmers have applied for and received permits from the M. D. AC to release black carp into their catfish ponds. If black carp escape in large enough numbers to reproduce and spread, and this is almost certain, biologists fear it could decimate our already threatened native mussels making it the most damaging carp of all. In addition, because of its food choice, it is a hosted many parasites, flukes, fungal bacterial and viral diseases that could infect support food or threatened and endangered fish species. From the fish farmers point of view, the grub like parasite that infects farm raised catfish taints their meat and reduces or destroys their marketability. However there does appear to be methods available other than the use of black carp. Red deer sunfish are said to be as well or better suited to serve the same function and other methods are being investigated, but fish farmers are looking for an immediate source of relief from the parasite problems. The threat posed by this species is so severe that in Missouri the Department of Conservation will carry out the elimination of all black carp in Missouri and not certified to be sterile. Hopefully other states such as Mississippi and Arkansas will reconsider and adopt this plan. Exotic species such as black carp are one of the most serious natural resources issues in the United States today. Introduction of exotic species is costing the taxpayer billions of dollars every year. Some were introduced accidentally via commercial shipping such as the zebra muscle and around Goby, others such as the common carp and the Asian carps were introduced deliberately but all pose a serious threat to our native species. The Mississippi River our grandchildren will will fish in has the potential to be far different from the river of today as ecstatic species have the potential to change the Mississippi River forever. Concerned about EATING fish from the Upper Mississippi River? Click link for more info. Click, left, to sign up here for FREE WEEKLY UPDATES on Travel, Heritage and Natural History along the Mississippi River! Please put "UPDATES" in the COMMENT area. You may also add any additional comment! And don't leave home without the indispensable guide to Mississippi River and Great River Road travel! .... Many Birding hotspots are noted in the NEW greatly expanded Volume 1, of the classic Mississippi River travel guide: Discover! America's Great River Road, Vol 1.